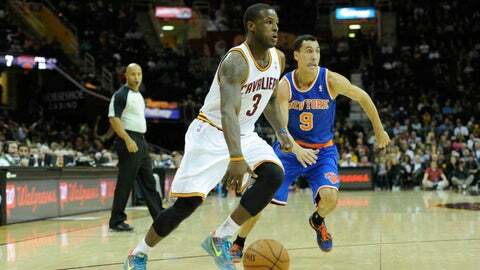 CLEVELAND — Dion Waiters says he hasn’t told anyone he wants to part ways with the Cavaliers. The second-year guard did admit, however, that he’s a little tired of being the center of trade rumors. “Yeah, man. Dion this. Dion that. You know,” he said while smiling in the Cavs’ locker room prior to Tuesday’s game vs. Portland. Bleacher Report cited sources in a story earlier Tuesday that indicated Waiters wanted out of Cleveland. His name also was the main topic in early-season reports involving a supposedly confrontational team meeting. Waiters is averaging 14.4 points on 42 percent shooting. He has come off the bench in each of the last seven games (leading up to Tuesday). The Cavs won five of those. On the bright side, Waiters at least knows what to expect when these rumors pop up.